Stars And Garters: Friday Night Fights: Mosquito - Round 9: Para-PSYCH!! Friday Night Fights: Mosquito - Round 9: Para-PSYCH!! Remember when Superman could be a fun kind of jerk instead of a broody, ragey one? Then tonight's round of of Friday Night Fights: Mosquito is just for you. It comes to us from Superman#322, written by Martin Pasko and illustrated by Curt Swan and Frank Chiaramonte. Synopsis: The Parasite has gained access to the U.S. government's Laser Defense System (LDS) and has used it to hold Metropolis hostage, threatening to destroy the city with an LDS laser attack unless the same U.S. government pays his huge ransom demand. The government balks, but Superman has thwarted Parasite's laser reprisal attack by moving the Earth out of the way of the laser. The two engage in a sky-level heat-vision fight, and Supes gets the upper hand, knocking Parasite onto an abandoned amusement park roller-coaster track while simultaneously taunting him about how stupid his whole ransom plan was. ...SOLOMON GRUNDY IN A SUPERMAN CAPE???? There's an explanation for that, you see. 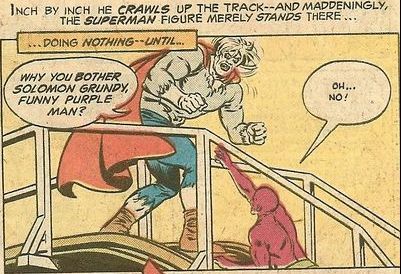 Grundy (actually Grundy II, an "offspring" of the original Grundy) had recently fought Superman in Metropolis after deciding he wanted the ability to fly and assumed that stealing and wearing Superman's cape would allow him to do so. We learn that in the course of trying to stop the Parasite, Superman apparently promised Grundy off-panel that he would give Solomon one of his capes and bring him to a lower-gravity planet where he could fly to his heart's content. So not only does Supes defeat and taunt Parasite, but he takes the time to set Parasite up to attack a doppelganger just to screw with him. 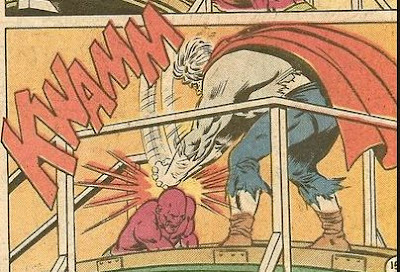 So, yeah, Bronze Age Superman could be kind of a jerk sometimes. But here, at least, he's a jerk in a harmlessly fun way instead of rage-killing someone with his heat vision just because they accidentally blasted his girlfriend, amirite? Tonight's fight music is this power-siphoning song by KISS. For more muck-encrusted mind games, click here. And don't forget to vote! I LIKE this Superman! As you say, at least he doesn't blow an innocent man's head off! Messing with his mind on the other hand, can be...fun! I Said It Once Before, But It Bears Repeating!